Karl Lagerfeld is a weird dude. We all know that, which is why his latest runway design, lined with wind turbines and a tiled catwalk that resembled solar panels, has raised some eyebrows. 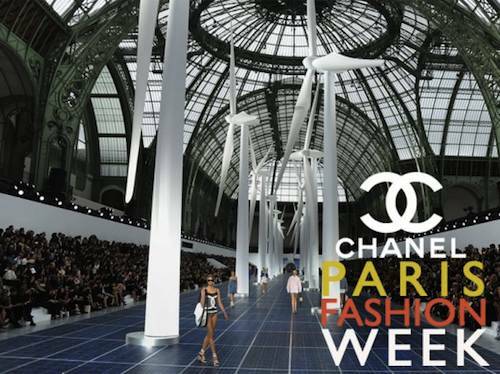 Is the Chanel designer making an environmental statement? Lagerfeld says he “started to sketch in St. Tropez over the summer and it was so hot I wanted some fresh air.” So I guess that’s a no. Even if he’s not making a direct statement, it’s a good thing, right? Some people are still turned off by wind turbines and solar panels for aesthetic reasons, but if one of the most widely recognized high-fashion designers in the world is using them on a fashion show runway design for his latest collection, they can’t be that bad, can they?